U.S. College Finds Priceless Coin Collection — In Its Own Library : The Two-Way Dozens of gold and silver coins, some from the eras of Alexander the Great and Julius Caesar, spent decades on a shelf in the University at Buffalo's library. Coins from the Thomas Lockwood Collection were recently found to be rare and priceless. From a description by the University at Buffalo, from top to bottom: A gold aureus of the Roman emperor Otho; a tetradrachm of Athens; a tetradrachm of Alexander the Great; a silver tetradrachm of Syracuse (Sicily); a gold aureus of the emperor Nero; and a gold octodrachm of Arsinoe II." 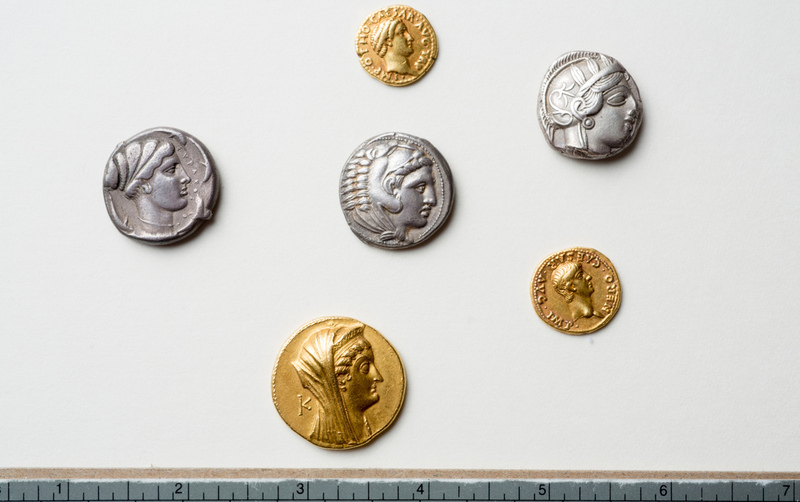 Dozens of Greek and Roman coins are part of a collection of ancient coins that was donated to the University at Buffalo in 1935. But it was only recently that the school realized how special they are. For years, the coins sat on a shelf in the school's library, mostly ignored — until a classics professor asked specialists to come to the archive and examine them. "I must have been the first person to touch them in almost 40 years," says Philip Kiernan, an assistant professor who became curious about the collection after he heard a rumor about it in 2010. It turned out the collection was real — and also, as they say, unreal. Most of the coins are in excellent condition; Kiernan says they include a "remarkably rare" gold coin featuring the emperor Otho, who only ruled for three months. The university describes the set as "40 silver Greek coins, three gold Greek coins and a dozen gold Roman coins — one from each era of the first 12 Roman emperors, from Julius Caesar to Domitian." One of the Greek coins portrays Alexander the Great as the god Herakles; another has an image of the Egyptian queen Arsinoe II. A Roman coin bears an image of the emperor Nero. As for how the university came to possess the set, the school says they were donated by Thomas B. Lockwood some 80 years ago, along with a collection of rare books. Kiernan tells the Buffalo News that he can't estimate the coins' possible market value, saying that "their historical value is absolutely priceless." He adds that the gold coins in the set "weren't really circulated. They were hoarded. Gold coins like that were made for storing your wealth. It wasn't spending money." The coins will now be restored, where needed; Kiernan is setting up a graduate course that will focus on studying the collection. The library's special collections curator who helped Kiernan find the coins says they're a reminder of the kind of relics that libraries hold. "Libraries are becoming museums," says curator Michael Basinski. "Everything is going digital, but we remain tied to the physical objects." 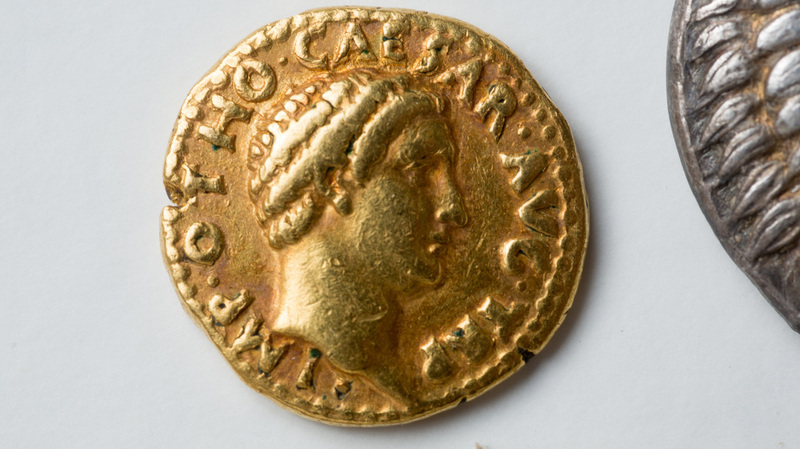 After assistant professor Philip Kiernan at the University at Buffalo asked specialists to look at the school's rare coins, they realized the set included a "remarkably rare" gold coin from the emperor Otho's short reign.